The North Island Volcanic Plateau covers much of this island paradise, and offers up a wealth of spectacular geothermal attractions in Rotorua. Crater lakes, sulphur pools, awesome mountains, crystal clear lakes and of course volcanic cones and calderas, typify the landscape. The last magmatic eruption here took place over 25,000 years ago, so just relax and explore the Jurassic plateau at your leisure. Anyone staying in the North Island should definitely make time to fully explore what the area is most famous for - its volcanic heritage. 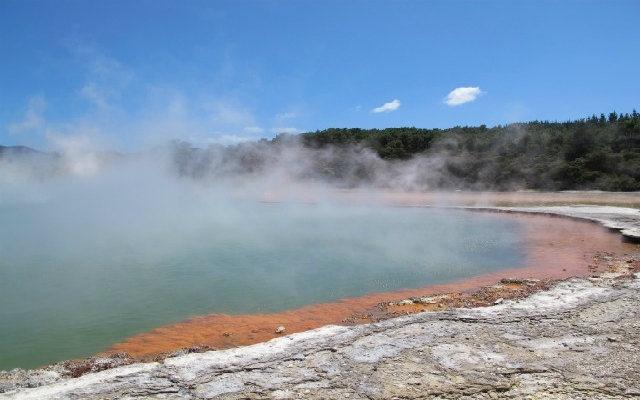 Here's our guide to some of the must-see geothermal attractions in Rotorua. A must-visit attraction for anyone who wants to know more about Rotorua's Maori heritage. Te Puia is a comprehensive educational and cultural centre, with plenty of interactive exhibits and outdoor natural wonders. 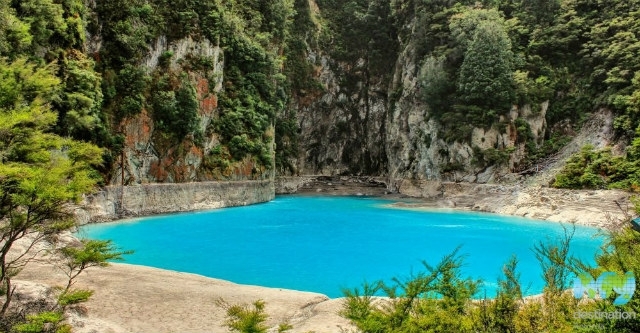 You can also wander the incredible geothermal valley of Te Whakarewarewa, with hundreds of sparkling mineral pools and dozens of geysers, including the famous Pohutu Geyser, which will spout sizzling hot water more than 100ft skywards. You can even book night-time visits, for the full 'kapa haka', nature walk and geothermal valley experience in a more magical setting. The valley was created from the eruption of Mt Tarawera, in 1886. It was a colossal natural disaster, which wiped out much of the surrounding area, including some Maori villages. In its place, it left plateaux of red, pink, blue and green shelves and columns, which are now the park's biggest attraction. Also contained here, is Lake Rotomahana, where boats operate a number of relaxing cruises. The Mt Hazard Trail offers walkers a chance to get high up over the valley and marvel at the Marble Terrace, Inferno Crater and Iodine Pool. If you're not feeling too energetic, the park runs buses through the valley, so you can hop off and on at one or all of the three stops. Waimangu Volcanic Valley is just 2.5 hours from the valley entrance, to the lake. Purchase a self-guided tour from $34.50, and explore the valley at your leisure. Location: 587 Waimangu Road off SH5, Rotorua. Meaning "Sacred Waters", this is one of the world's most natural theme parks. 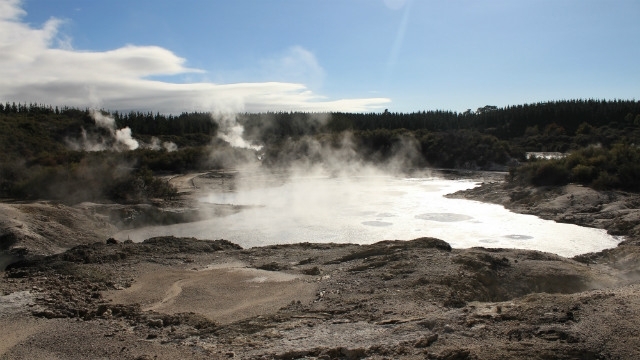 Sitting just 30kms from Rotorua, prepare to be amazed by sights such as the Champagne Pool. Artists will get a kick out of nature's very own colour palette, on display in the various mineral pools and crater lakes. 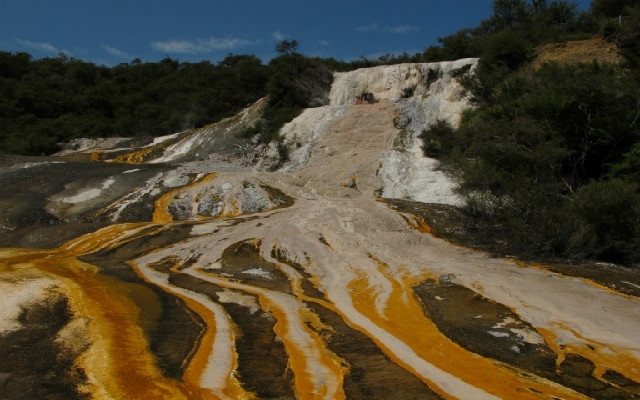 A visit to Wai-O-Tapu can include seeing the Lady Knox Geyser. You'll be standing open-mouthed at the sight of this grand old dame shooting boiling hot water 20m into the sky. She only comes alive once every day, normally in the morning. Also onsite, you'll find a delicious cafe, well-stocked gift shop, and a very interesting Visitor Centre. Parking is plentiful, and there are plenty of places to sit outside with a picnic. Location: 201 Waiotapu Loop Road, 3073, Rotorua. This geothermal theme park covers 50 acres of sulphur lakes, mud pools, fumaroles and red hot waterfalls. So it's a good job there's a world class spa next door where you can sit in a jacuzzi and feel the world float by. There are some great guided tours around the park, so it's the best place to learn about the sulphur pools of Sodom & Gomorrah (! ), the beautiful Sulphur Crystal Valley, Kakahi Falls and the Devil's Cauldron. Location: State Highway 30, Titikere, Rotorua. 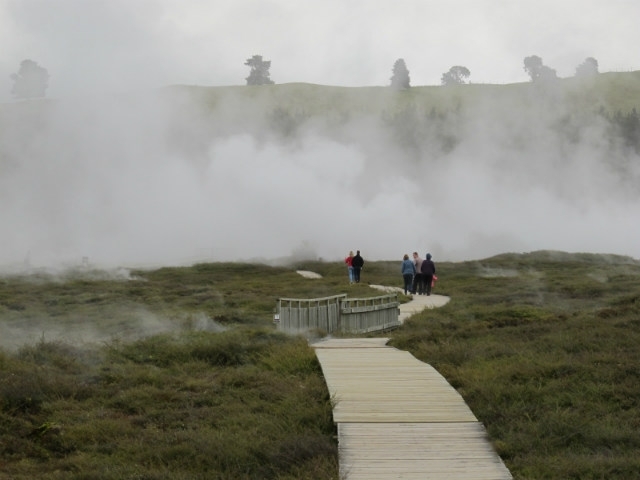 Orakei Korako is a stunning geothermal park which can only be reached by boat. Colorful silica terraces are a camera's delight, and the 'Hidden Valley' is like something from a film. It's the largest geyser field in New Zealand, filled with hot spouts of water, colourful mineral pools and rich, dense forests and glades. The spectacular Emerald Terrace has inspired artists around the world. Much of it is housed under the water, but the huge shelf of silica (the largest in the country), sits prettily alongside the Rainbow Terrace. Further along, you can see a whole spectrum of colour at the Artist's Palette pool, a sight which constantly changes according to the light of the day. At the Ruatapu Cave, you can descend down into the earth, to a hot pool 45m beyond. Back at the Visitor Centre, you'll find some gifts, plus a charming cafe. Location: 494 Orakei Korako Road, Rd 2, Reporoa, Taupo. 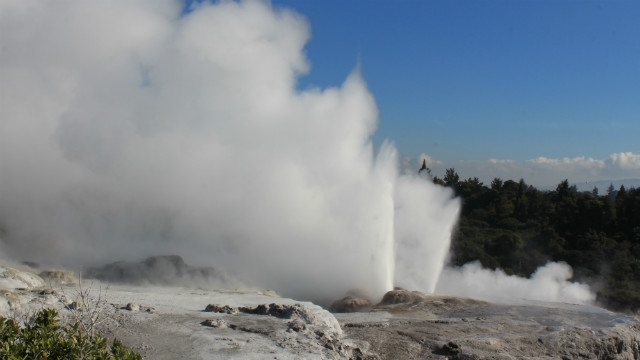 Comparing it to the moon is very apt, as it's the most 'lunar' of the area's geothermal parks. Stretched across around 35 acres, it was in the 1950s that the local tourist authorities began playing around with the natural landscape, convinced it could become a great attraction for visitors. The result, after years of hard work and careful consideration for the environment, is dozens of mud pools, mineral sculptures, craters, caves and fumaroles. Because it's so tropical here, you'll find some wonderful, lush plants and other vegetation, plus lots of bubbling brooks, pools and falls. Take the pretty hour's walk up to the panoramic viewing deck, to see the park in its full glory. Children will have no problem exploring the valley and it's also accessible by wheelchair. Location: North of Taupo, 2km from SH-1. The country's oldest national park, Tongariro is both a natural and cultural UNESCO World Heritage Site. It stretches across the centre of the North Island, and has three sacred volcanoes at its heart – Tongariro, Ruapehu and Ngaurohoe. Visitors tend to stay in the towns of Ohakune, Taurangi and Whakapapa Village, the latter being a very popular ski centre. 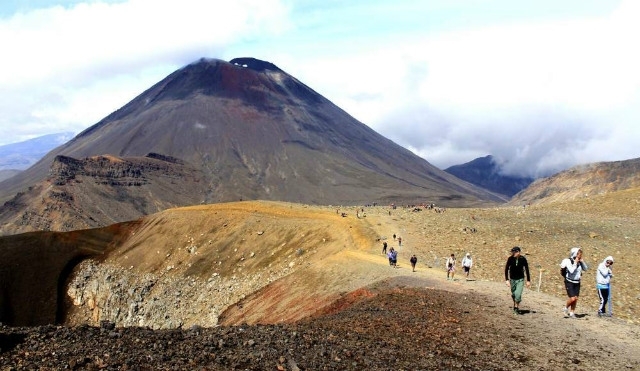 For many , the purpose of visiting is to tackle one of New Zealand's great walks - the day-long Tongariro Alpine Crossing, which, if you have a limited itinerary, is possibly the best way to see most of the varied landscape and terrain the park has to offer. Motels and cabins are easy to find around here, so it's a great base for mountaineers, snowboarders, and movie fans, who come to take scenic flights across Lord of the Rings country. Location: State Highway 48, Mount Ruapehu, Taupo. 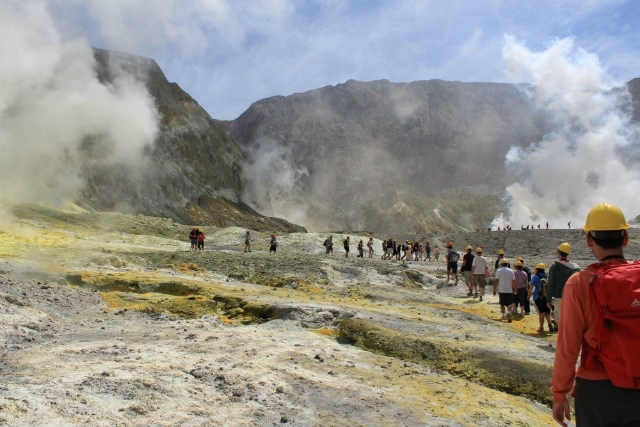 White Island is a Mecca for vulcanologists and can only be reached by special boat or plane charters. It claims to be the world's most accessible volcano. Called 'Whakaari' ('dramatic volcano') by the Maori, White Island sits 50km off the coast of Whakatane, and is 2km across. Sulphur mining used to take place here, but a catastrophic lahar disaster in 1914 put a permanent end to the mining industry here. Today, it is a carefully-controlled tourist destination, where people can come to marvel at spectacular fumaroles and bubbling mud pools. White Island is also an important bird area. 3000 pairs of Australasian Gannets come to breed here every year. Most island trips can be booked out of Whakatane including some overnight trips. Location: Depart from Whakatane, Bay of Plenty.